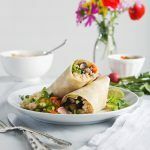 Now that we’re settled and lucky enough to have a kitchen we enjoy cooking in, we skip the banh mi from down the street and make restaurant-worthy versions at home. When you break it down, the components are actually pretty simple and the prep time is short, even if the ingredient list at first appears to be a little long. You might remember from previous posts that I hate prepping produce. I’ll happily spend an hour icing cookies, but thinly slicing cucumbers or peeling carrots? Ehhhh. I’m not into it. That’s why unless it was absolutely necessary for a recipe, I’d do a minimal rough chop and skip the peeling altogether. Well, that was until I discovered a new-to-me German brand, Börner, and their V5 PowerLine Slicer and 6 in 1 Peeler. Börner has just started branching out to offer their kitchen tools in the USA and I’m seriously smitten. The difference between these tools and the mandoline slicer and peeler I had been using (or rather, not using) is like the difference between cutting an apple with a disposable plastic knife and a high-end chef’s knife. The stainless-steel blades are laser-sharpened, the plastic is BPA-free, and all of their products come with a five year guarantee. I peeled an entire bunch of carrots in under a minute, and sliced and julienned radishes, cucumber, and jalapeño in no time at all. It was so speedy and fun, I almost looked for more things to slice. Another thing I love about these Börner tools is that they’re exceptionally well-designed and multi-functional. 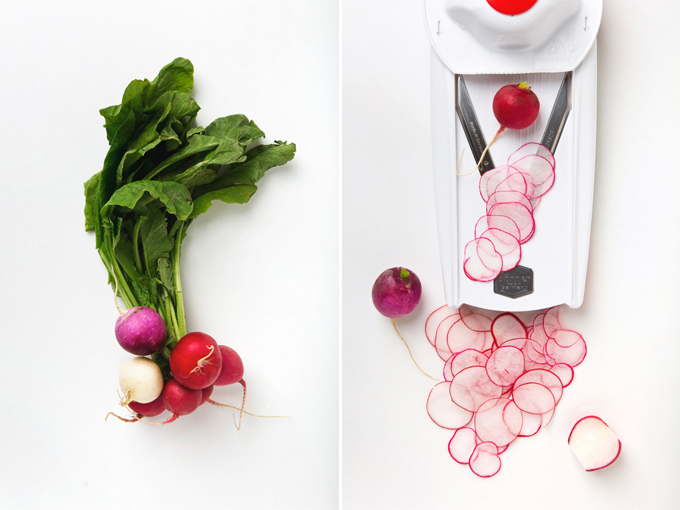 The V5 Slicer has three adjustable inserts: one slices in four different thicknesses, one does thicker julienne cuts, and the third does thinner julienne cuts (you can also use the julienne inserts to make cubes that are diced or finely minced—perfect for quickly prepping onions without the tears). 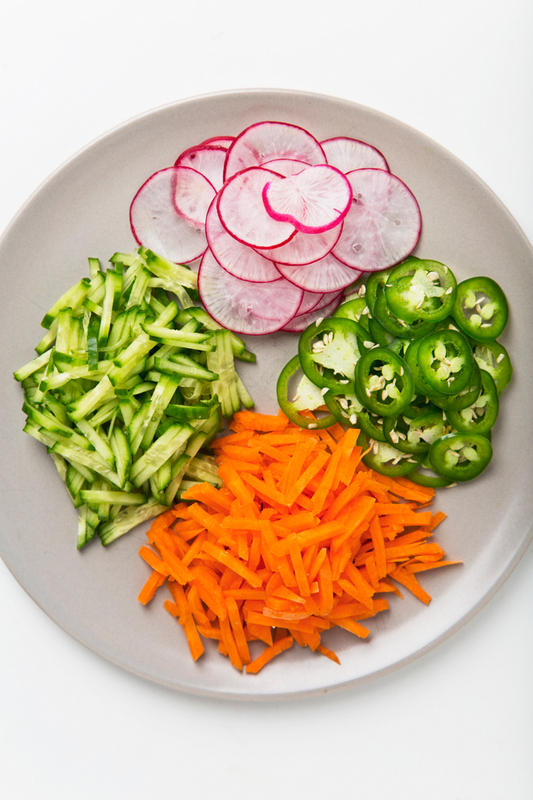 For the banh mi quick pickles, I made paper-thin radish and jalapeño slices and small, julienned carrots and cucumbers. They turned out much tastier than the pickles I had been making using my old knife, and in about a tenth of the time. And because the veggies are sliced so thin, they’re ideal for non-messy sandwiches and wraps! Nerding out over kitchen tools aside, I’m pumped with how this vegan and gluten-free banh mi bowl turned out! I used rice as the base in mine (quinoa would work too), and marinated some pressed extra firm tofu in a simple mixture of soy sauce, fresh lime juice, garlic, and peanut oil. Since I pressed the tofu until it was about half of its original thickness, it really soaked up the marinade to become extra flavorful, chewy, and crispy when cooked. 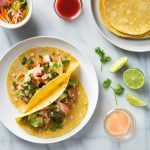 If you’ve tried tofu in the past and found it to be mushy or blah, definitely give this method a try! 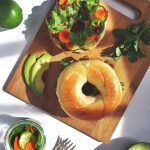 Easy vegan banh mi bowls made with tofu and quick, homemade pickles that you'll want to put on everything! Make your bowl with rice or use quinoa for an extra protein boost! Make the pickles: Add all of the pickle ingredients to a medium jar, close the lid tightly, and shake to combine. If the vegetables aren't completely submerged in the vinegar, add just enough water to cover them. Refrigerate for 1 hour. Prepare the tofu: In a shallow dish, combine the soy sauce, lime juice, peanut oil, and garlic. Add the tofu to the marinade, tossing to coat all sides. Cover and refrigerate for 30 minutes. Heat a non-stick skillet over medium heat. Once the pan is hot, add a small pour of peanut oil and cook the tofu, giving each piece a little space on all sides to brown. Cook the tofu for 2-4 minutes on each side, until browned and slightly crispy. Remove the pan from the heat. 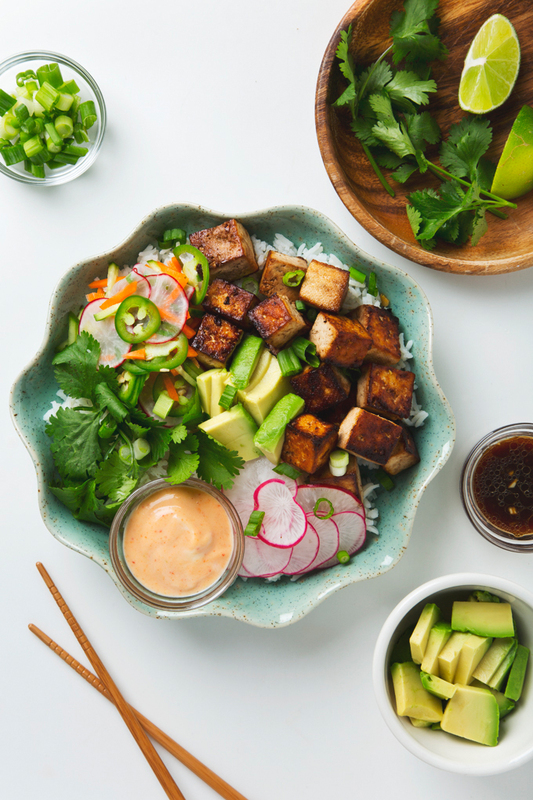 Assemble the bowls: Add a serving of rice or quinoa to each bowl, then layer on the tofu, pickled vegetables, avocado, scallions, cilantro, and drizzle with spicy mayo. Normally I only press my tofu for 5-10 minutes, but for this recipe it's best if you can press it for 30 minutes or more to remove as much water as possible and allow the marinade to really soak in. The result is a chewy tofu that's loaded with flavor. It will also get extra crispy around the edges when you cook it! Interested in buying a Börner slicer? Use coupon code “picklesnhoney” to get 10% off your purchase! Börner is generously giving away their signature peeler, the Garnish Peeler 6 in 1 with Rasp, to one lucky P&H reader! This is the peeler I use and love. It has a sharp serrated blade and an integrated grater on the back that allows you to peel, decorate, grate, cut out and garnish your fruit and vegetables—six functions in one tool! Or, if you’d rather have a different Börner product, let me know in the comments and we’ll send the winner a $20 coupon code to use toward anything she (or he) likes. To enter, simply like Börner on Facebook and follow them on Instagram, then visit their website and leave a comment on this post letting me know which color you’d most like to win! I’ll randomly choose a winner on Wednesday, December 28th at 12pm ET. Please note that the giveaway is open to US residents. Good luck! Thank you to Börner for sponsoring this post! Make sure you visit their website to watch videos for the V5 PowerLine Slicer and 6 in 1 Peeler in action (they’re really quite impressive). Börner kitchen tools can be purchased directly from their website or you can find them on Amazon! 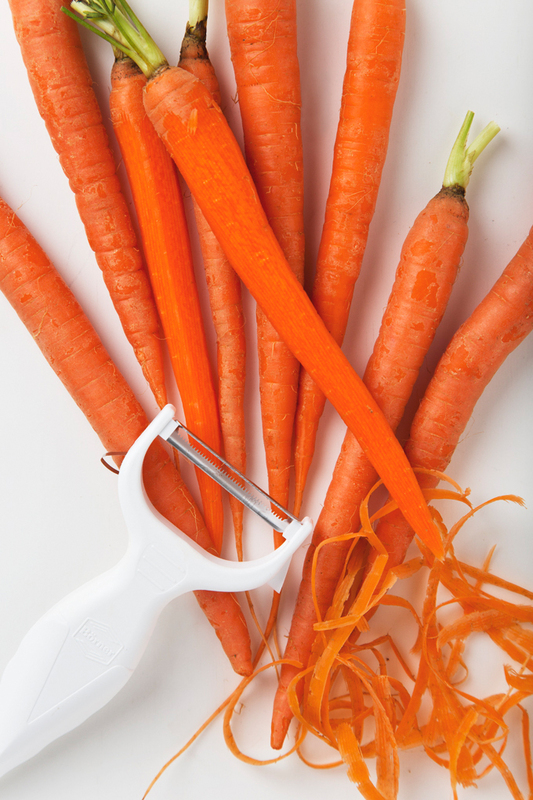 I’d love to win the green Garnish Peeler – to match my veggies! PLEASE PLEASE PLEASE, I HAVE TO HAVE A PURPLE ONE!!! Also, just have to say, I recently found your food blog via instagram and so far everything I’ve tried has been amazing! Definitely adding this to my long list of bookmarked recipes to try in the new year! I would LOVE the white one! I have an all white kitchen and love the contrast of white with bright colored Effie’s! Also, I am making this dish ASAP! Can’t wait! Auto correct.. that was meant to say right colored VEGGIES! Any color would be fine but I prefer green. Thanks for sharing so many wonderful recipes! The Purple Borner Garnish Peeler 6 in 1 with Rasp is awesome. I like the white one! Thank you for doing this giveaway, Amanda. I love your blog! I made this for lunch today just as soon as I saw your recipe. It was SO good! Much better than buying banh mi near me. That tofu!! I’m going to use your cooking method for tofu from now on. Oh, I forgot to enter the giveaway! I would love to win the purple vegetable peeler. Thanks Amanda! I’m quite partial to the purple peeler. And oooh boy do I want that mandolin. I might just have to get myself a Christmas present. I like the red peeler. Purple, please! Thank you for doing this giveaway and for sharing your recipes with us! This tool looks AMAZING! I like Börner on Facebook and follow them on Instagram. And I would LOVE the white color. Wow, these Borner tools sound great! I bet they’re really high quality since they’re made in Germany. I would really like the orange color. Thanks! I would love to win the white peeler! I love the white one! This recipe looks great though! Yum! That looks so delicious! I would love the purple one! I’m always so hungry after I read your posts. 😉 I would pick the red peeler! OMG your photos! You two are so talented. I would love to win the purple one! Thank you. I’d love to win any color, but green the most. I have nothing green in my kitchen (besides the veggies of course). Thanks for the pickles recipe. 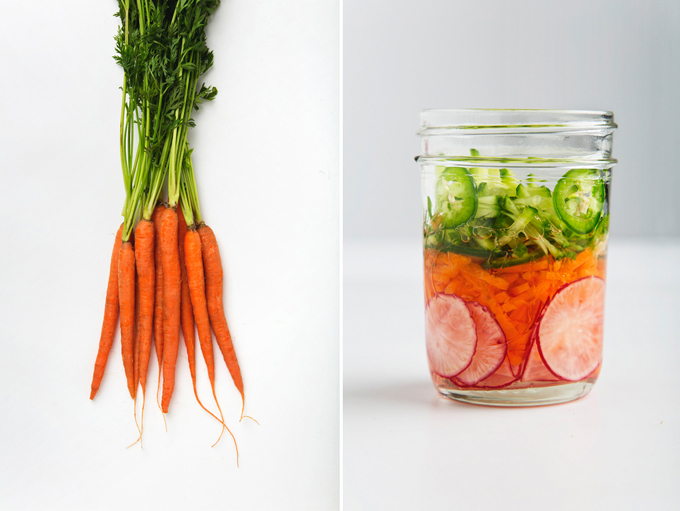 I always want pickled veggies but didn’t know it could be so easy! Great colors! I really like the orange one! The Börner Garnish Peeler 6-in-1 in purple would be great! Oooh, I would choose the purple one! I’ve been looking for a good veggie peeler (mine is old and dull). Thanks Amanda! The white peeler, please! Hope you had a Merry Christmas, Amanda and Aaron. I recently found your blog on Pinterest. Your recipes are right up my alley. 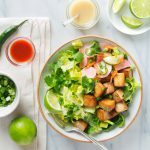 I’m planning to make this Banh Mi Bowl for dinner tonight. I would choose the $20 coupon toward the Borner V5 slicer in the white color like you. Thank you for doing this giveaway. Done, done, done! What an interesting tool. I would choose the green one. I love this recipe Amanda! I would choose the white peeler. Thank you! I saw your post on IG just now and I had to enter. I NEED the red peeler in my life!! Thank you for hosting this giveaway! Purple!!! It’s my fave color. Love the white one. Can’t wait till I get home from vacation to make this recipe. Love pickled veggies. Classic white for me! Great recipe, thanks! oh man oh man! What a great idea. I can’t wait to try this later. I liked Borner on FB and followed them on IG. I would love to have those beautiful tools in purple. Thanks for the giveaway! I’d be thrilled to win the peeler in orange, to match my orange lemon juicer, tongs, and measuring cups. #bowlgoals lol I would love to win the purple kitchen tools! The red one. Thank you. I really like the classic white color. 🙂 Your recipe is so beautiful by the way. I would choose the white peeler. I hope I’m not too late to enter…I would love the orange peeler. Thank you Amanda and Aaron! I made this today and it was delicious, the mix of flavors was amazing! I was wondering how long I could keep the spare pickles? I get a little worried about bacteria when not pickling/fermenting carefully! Thanks for getting back to me! I always worry about botulism! But I’ll eat the rest today with the leftover tofu and rice ❤️ Two day deliciousness! This was delicious!!! Definitely going into the “keeper” pile! I made this tofu for my family last night and it was wonderful. 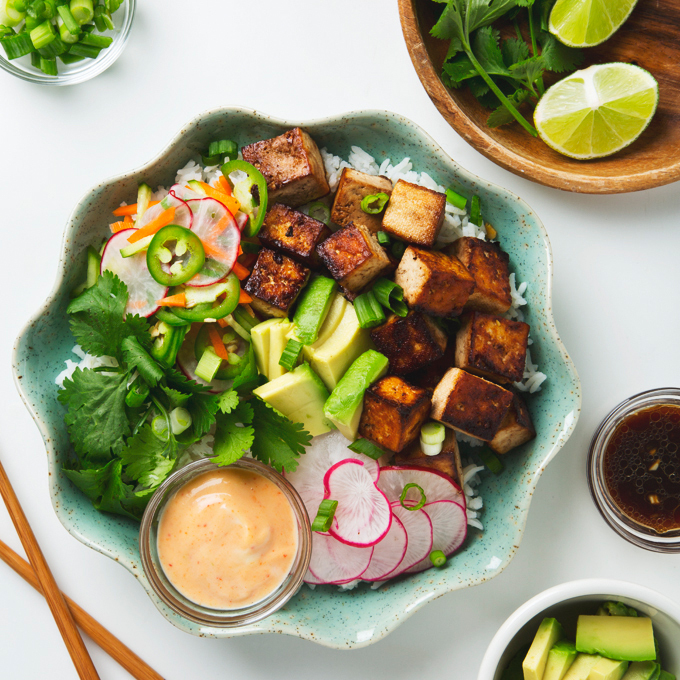 Even though we have been eating a plant based diet for a long time, I had never attempted to make tofu before because I was unsure of how to prepare it and I was afraid that it would not taste good. However, I was delightedly surprised by your recipe. I used 365’s organic tofu. I was curious what your go to brand of tofu is? Thanks for another great recipe.